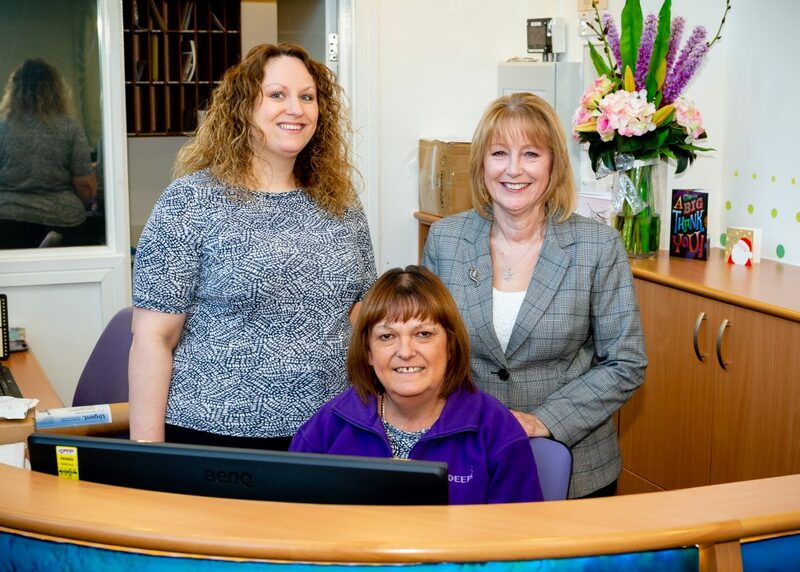 Pic shows (from left) Leah-Anne Shillito, Sue Waterhouse and Freya Cross behind the reception desk at The Deep Business Centre. The team at one of the region’s leading business centres marked the end of an era with the departure of a familiar face after 18 years. Leah-Anne Shillito was involved from the outset as The Deep Business Centre itself launched as a start-up in 2000, opening its doors to tenants the following year. Since then she has played a major part in reception and admin roles as The Deep has provided a platform to support more than 200 different businesses employing more than a thousand people. Leah-Anne has left for another well-known Hull-based business, joining the team at The Spencer Group’s headquarters at Humber Quays as an executive admin assistant. Freya Cross, Business and Corporate Manager at The Deep, first hired Leah-Anne as an apprentice in 1996 to join her at Commerce House in Paragon Street, Hull. When the opportunity arose to shape a new generation of business centres at The Deep, they jumped at the chance to offer high-tech facilities in a stunning location on the banks of the Humber. Freya said: “Initially the business centre was at pre-handover stage so we operated from an office on Ferensway, overseeing the installation of state-of-the-art communications facilities and contacting prospective tenants. “When we moved across we didn’t even have a reception desk or formal office, but it was beneficial for us to be involved at such an early stage, looking after the fit-out with phone systems, furniture and everything else and making sure all of the facilities were just right. Sue Waterhouse, who has worked at the centre for 17 years, will continue to provide tenant liaison and reception services whilst Leah-Anne’s replacement will co-ordinate meeting and conference room requirements and carry out general administration duties. Leah-Anne said: “It feels strange to think back to the days when there was nothing in the building. In the early days it was just space in here, plenty of it before all the offices were built. “That enabled us to host quite a lot of big events for the likes of Hull City Council and Yorkshire Forward. We had the launch for the business centre itself when Tony Blair came here and for The Deep with Prince Andrew. “Bit by bit the offices filled up. There are more than 40 businesses here now and over the years more than 150 have come and gone. We specialise in supporting start-ups and nurturing small businesses and the failure rate is very low indeed. When businesses leave it’s usually because they have a need for more space than we can provide or to accommodate industry-specific facilities and equipment. 1 Comment on "End of an era as Leah-Anne leaves The Deep Business Centre"